FINALLY, after much hard work, we have formally applied for membership in the national MQG and have a Guild bank account! However, MQG has a computer glitch, so we’re not officially a member guild yet, but our work on this is done. Thanks to all who worked so hard, especially Melanie. Now let’s move on to the fun stuff! Melanie helped to simplify the communications methods the Guild will be using – much appreciated by those of us who grew up with one phone in the house, and it was wired to the wall in the hallway! Guild web site: www.njmqg.com This is where all official communication will be posted. It also takes the place of the old blog and will contain the show & tell pictures, general meeting summary, etc. This site is public, except that there is a separate members-only section which will contain guild confidential information (bylaws, board meeting minutes, roster, etc.) The framework is in place but is still very much a work in progress. We also have a group on Facebook. This is a private group for Guild members only. This is a very informal platform, much more laid-back than the web site. This is where guild members can ask for help about specific problems, share what they are working on, etc. Please note that there is a private “group” and a public “page.” They are not the same thing. Members in good standing have been emailed an invitation to join the group. 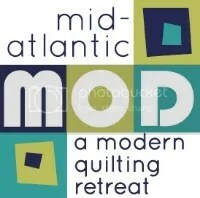 If it ended up in the spam folder or you are new, please search for North Jersey Modern Quilt Guild and request to join. Melanie and Ashley will authorize requests. This site is up and running – and guild members have been very actively sharing on it! Lots of fun! It’s nice to make a connection with people since quilting is generally such a solitary occupation! Beth updated us about some upcoming programs in the next few months. Will be on first Thurs of each month, alternating day and evening. People should bring their own machines and supplies, but there are plenty of big tables. This is a time to work on your own projects in a social atmosphere. A sign-up sheet was passed around. If you are interested in being kept informed, notify Melanie. First one will be during the day on Thursday, 10/3. Will be at the Church of Jesus Christ of Latter Day Saints in N. Caldwell. Full details will be made available to members within a few days. Thanks to Stephanie for making the arrangements for us! Liesl is the great designer behind the wonderful sewing patterns Oliver & S and Lisette. She has graciously agreed to give us a tour of her Brooklyn studio on Saturday, October 12. She is going to focus on how to achieve texture in quilts – sounds great! A sign-up sheet was passed around. Full details will be made available to members within a few days. We’re going to make a quilt to display at meetings, shows, etc. The general plan is that everyone will make a block then we’ll work as a group to sew it together and quilt it. More will be discussed about this at the next meeting. 11 interested members signed up for this sewing bee. The idea is that each person is the “queen” for one month – she gets to choose the fabrics, etc. Everyone else makes a block to her specifications and brings it to the next meeting. Voila – a new quilt top! Email Melanie or njmqginfo[at]gmail.com if you’d like to join this group– they will email privately. 6 people signed up for the Name Tag swap and were divided into 3 pairs. Each should make a name tag for her “partner” – preferable by the next meeting. The only stipulation is that the name tags be presented at a meeting for us all to enjoy! Kourtney and Emma exchanged their name tags – beautiful! Daniela enthusiastically shared her works-in-progress from this MQG event. She had a wonderful time and very highly recommended the SewDown experience. Start thinking about this! A group may be forming to attend this MQG event on April 11 – 13, 2014. See the MQG web site for all details. Don’t forget, we are eligible for the discount as official MQG members now! Beth is compiling a list of people who’d like to present a workshop focusing on specific skills. Our first volunteer is Stephanie who will teach us the Six Minute Circle technique. Please let Beth or Melanie know if you have a particular skill you’d like to share with the group. These will be held at Sew-in meetings. Aleeda has booked a retreat weekend for us at the Crossroads Retreat Center in Califon. The dates are Fri-Sun, March 21 – 23, 2014. The details are still being ironed out, but it will cost about $185 which includes all meals from Fri dinner through Sun. Deposit will be needed by the end of November and the Guild needs to confirm at least 12 attendees. Aleeda passed around a sign-up sheet and will provide more details in the coming weeks. Let her know directly if are interested. Garden State Quilters has generously extended an invitation to us for Victoria’s presentation on Monday, November 11, 2013 for free. (Victoria, as you are probably aware, won the Best Of Show award at QuiltCon.) They asked us for a head count, so if you are not a member of Garden State and would like to attend this presentation, please let Melanie know. Just FYI, it takes about 30-40 minutes to get there from Montclair. 15 members shared the challenge blocks they made using Cloud9’s “Land That Never Was” fabric – amazing how different they were! Michelle and Gina (owners of Cloud9) will pick their favorite and Rock Paper Scissors is donating a $25 store certificate to the lucky winner! Eventually we’ll have a guild project to make a quilt from the blocks. There will be another post after this one with pictures of all our blocks. If you weren’t at the meeting and need to get your block in for judging, email Melanie ASAP. Great meeting, everyone! Keep an eye on the blog for all kinds of information in the next few days. Love these meetings!! Everyone is so talented!